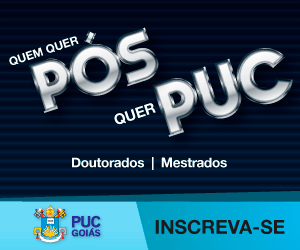 PUC Goiás offers 3 doctoral programs and also one interinstitutional doctoral program. The research guideline of our graduate programs is the qualification through academic excellence of research group and lines in order to enhance regional and national development. Accredited by CAPES (ranked 4), the Graduate Program in Education focuses on the study of Education and Society, and it offers three research lines: ¹ State, Policies and Education Institutions, ² Education, Society and Culture, and ³ Education Theories and Pedagogic Processes. Accredited by CAPES (ranked 4), the Graduate Program in Psychology focuses on the study of Psychology, and it offers three research lines: ¹ Behavior Analysis and Evolution, ² Social, Work and Organization Psychology, and ³ Clinical Psychopathology and Health Psychology. Accredited by CAPES (ranked 5), the Graduate Program in Religion Sciences focuses on the study of Religion, Culture and Society, and it offers three research lines: ¹ Culture and Symbolic Systems, ² Religion and Grassroot Movements, and ³ Religion and Sacred Literature.